Linda specializes in problems of the breast. She has a special interest in working with individuals who are at elevated risk of breast cancer. Her clinical credentials include Certified Breast Care Nurse and Gerontological Nurse Practitioner, Board Certified. Linda is an affiliate member of the American Society of Breast Surgeons, the Oncology Society of Nursing, the American Nurses Association and its Wisconsin affiliate, and Sigma Theta Tau International Honor Society of Nurses. She has served as president of the Madison District of the Wisconsin Nurses Association. 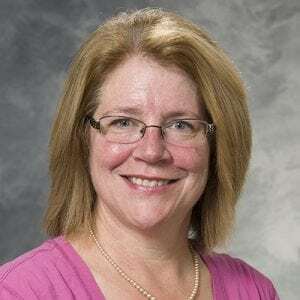 Linda has been an invited lecturer on the topic of benign and malignant problems of the breast in the UW School of Nursing and UW Physicians Assistant Program as well as on the topic of the patient experience of breast cancer in the Chaplain Residency Program of UW-Madison. She has participated in and volunteered at the Madison Komen Race for the Cure for several years. Linda is involved as co-investigator on a project looking at improving screening of individuals at high risk of breast cancer and is interested in projects which improve the experience of patients undergoing breast screening, prevention, evaluation, and treatment.